Engineers in South Korea are making final preparations for the launch of a small satellite Wednesday, hoping to forge a successful ending to a partnership of Korean and Russian rocket developers which has suffered two failed launches since 2009. Liftoff of the Korea Satellite Launch Vehicle, or KSLV 1, is expected in a launch window opening at 0655 GMT (1:55 a.m. EST) and closing at 1030 GMT (5:30 a.m. EST) Wednesday. South Korea's Yonhap news agency reported Tuesday the launch was targeted for 0700 GMT (2 a.m. EST), but officials will decide the exact time two hours before liftoff. 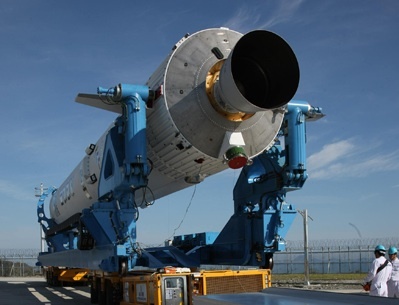 The 108-foot-tall rocket will take off from a launch pad at the Naro Space Center, a facility about 300 miles south of Seoul. Officials have until Feb. 8 to launch the rocket, or else wait at least several weeks for another opportunity. Workers moved the two-stage booster to the launch pad Monday, made final fueling and electrical connections, and lifted the rocket vertical. The launch team conducted a countdown rehearsal Tuesday. The KSLV 1 booster is composed of a Russian first stage and a South Korean upper stage. The first two KSLV launches in 2009 and 2010 failed to reach orbit, and the launcher now on the pad was grounded during two launch attempts Oct. 26 and Nov. 29. In the two months since South Korea's last satellite launch attempt ended with an abort, North Korea scored its first successful space launch Dec. 12 as its southern neighbor labored to resolve a slew of technical issues. The KSLV's Oct. 26 launch attempt was scrubbed several hours before the scheduled liftoff time by a fuel leak in the connection between the launch pad and the Russian-built first stage. The Nov. 29 countdown was cut short by a problem in the Korean upper stage's steering system. Moscow-based Khrunichev, which builds Russia's workhorse Proton rockets, manufactured the KSLV first stage and lent expertise in construction of the Naro launch pad and control center under a 2004 contract signed with the Korea Aerospace Research Institute. South Korea has spent about $471 million in the Naro rocket program since 2002, according to Yonhap. Wednesday's KSLV 1 launch is set to be the last chance for the joint Russian-Korean program to succeed. South Korea's partnership with Russia ends after the upcoming launch, and the rising Asian power is plotting an independent space program with a fully homemade rocket to launch around 2021. Khrunichev's contribution to the KSLV 1 booster is based on the universal rocket stage designed for Russia's Angara launcher, which the country envisions will carry a wide range of satellites to space beginning as soon as this year. The Angara can fly with clusters of three to five universal first stages to haul heavier spacecraft to orbit. A single kerosene-fueled RD-151 engine will generate 375,000 pounds of thrust to power the 10-story rocket off the launch pad. Produced by NPO Energomash, the RD-151 engine is a smaller version of the engine used on Zenit and Atlas rockets. Passing the speed of sound in the first 55 seconds of flight, the KSLV will reach the upper atmosphere, release a clamshell-like aerodynamic nose shroud, and separate its Russian upper stage in the first four minutes of the mission. The Korean-built solid-fueled upper stage will fire for 58 seconds to place the 200-pound STSAT 2C spacecraft in a 186-mile by 932-mile orbit.